Albany, NY (USA) -- It appears our world is becoming more violent. Our country and citizens are feeling intense vulnerability in the wake of 9/11 and the spiraling strife in the Middle East. Most everyone would agree that "something" should be done to stem this violence. Buddhists take an altogether different approach: They sit and do "nothing." This is an oversimplification, but it contains an important element of truth. 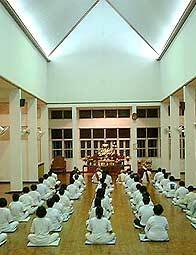 Buddhist meditation is often described as a process of familiarization. We strive to become familiar, completely familiar, with our own minds and who we really are. This is done by simply letting go, "doing nothing," and observing our own minds. This goal is often characterized as ambiguous, impractical, unattainable or unnecessary. In spite of these sentiments, most people who make a genuine effort at Buddhist meditation report gaining at least a modicum of familiarity, or insight, into their minds and lives. These insights, however small, do help. They also accumulate over time. What does this have to do with creating a more peaceful world? Everything, from a Buddhist perspective, because such a world is simply not possible without peaceful individuals. We are constantly changing the world by our interactions with family, friends, co-workers and even enemies. Unfortunately, we are run through the same old scripts and routines that sow the seeds for the violence. Buddhist meditation offers a window through which to view our lives and an opportunity to awaken from our habits. It is precisely by stopping and "doing nothing" that we can examine the assumptions and reactions that contribute to violence and the suffering it causes. Once these come to light, we are at liberty to drop the negative behavior or belief. Buddhism teaches that our problems stem from our inability to consciously make these decisions and exercise true freedom. Most anyone who has engaged in any form of Buddhist meditation will be quick to point out that the process is neither quick nor easy. They might also note that we often discover things about ourselves that are difficult to face. I might find that I tend to act in selfish and self-centered ways or discover my actions have contributed to violence, in my family, workplace or community. These lessons can help us experience compassion for ourselves and others. We see that despite our best intentions, we are often confused and not living up to our potential. We can bring that insight to mind when witnessing others behaving poorly. Rather than view them as simply bad, we can begin to identify with them and remember when we behaved similarly. Once we begin to recognize that confusion is the root of our problems, that the enemy is our own hatred and anger, we can be effective in our attempts to create a more peaceful world. Meditation is just one tool that has been developed to help people function better. From a Buddhist perspective, each religious tradition makes invaluable contributions toward this end. We are fortunate to have so many different tools because there are so many different types of people. The Albany Karma Thegsum Choling Tibetan Buddhist Meditation and Study Center offers instruction in a variety of Buddhist meditation practices. Based at the Doane Stuart School, where we meet Sundays and Wednesdays, the center also provides members with an opportunity to volunteer together on community activities. We call this Dharma in Action. It is a way to apply what we've learned from "doing nothing" and give something to others while deepening our understanding of ourselves and the world. Dean Hill of Slingerlands recently received a master's of social work degree from the University at Albany and will begin work at the state Senate with the New York State Legislative Fellows Program.